Have you ever wondered what the advantage would be to engineer and design your own custom aluminum extrusions? You’re not alone. There are many industries that now choose to extrude aluminum alloys into complex shapes and designs that are better suited to their specific needs. Instead of selecting standard extrusions, companies are working with custom aluminum products to reduce cost, improve performance, and shorten lead times. There are many advantages associated with using custom profiles, so it is easy to see why so many industries are now choosing to work with Silver City Aluminum for all of their custom aluminum extrusions needs. Aluminum has earned a “solid” reputation for providing a much higher strength than most people once thought. The aluminum that is used to create beverage cans is not the same strength, thickness, alloy, or production process used to create aluminum parts for industry. Many different types of industries that rely on the strength of aluminum include transportation, aerospace, military and defense, marine, and construction. Higher strengths can be achieved when copper, magnesium, silicon, manganese, or zinc are added to the aluminum alloy to better meet the needs of the client. One of the reasons why aluminum is so big right now in manufacturing is due to its high strength to weight ratio. Aluminum alloys are approximately one-third the weight of other metals that were once used in the same manner, providing better fuel economy for consumer vehicles and mass transportation, as well as lower weights for the development of airplanes and speedboats. Many industries appreciate the fact that custom aluminum products are an excellent conductor of heat and cold. This is the primary reason why custom aluminum extrusions are used to create engine components, heat sinks, cookware, and HVAC units. The options available with custom shapes help to reduce post extrusion operations and optimize the natural thermal conduction properties of the metal. 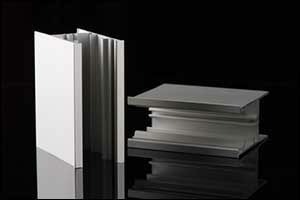 Aluminum features a naturally-occurring, transparent oxide film. In fact, for many applications, your custom aluminum extrusions will not need any additional protection. However, if you want to further enhance this natural protection, you can treat your custom aluminum products with a wide variety of coating solutions, such as paint, powder-coating, and anodizing. While some materials will become extremely soft in high heat or brittle in extremely low temperatures, when you extrude aluminum alloys, they are actually quite temperate. Aluminum will soften somewhat at temperatures above 400 degrees, but the metals added to the alloy can help to increase its abilities in extreme heat. In cold temperatures, the strength of the aluminum used in our custom aluminum products will strengthen instead of becoming brittle like many other metals. This makes it ideal for extreme conditions. Thanks in large part to consumer awareness and public service announcement commercials, most individuals are acutely aware of aluminum recycling, particularly aluminum cans and other household items. As a result, aluminum has become the most recycled metal in all of America. Unlike other metals, it can be recycled over and over again without losing any of its inherent qualities. That means that aluminum is not just sustainable and earth-friendly, but it is plentiful and available for industry, making it even more cost-effective. In addition to being a great conductor of cold and heat, aluminum also has the ability to conduct more than twice as much electrical current as the equivalent weight of copper. High conductivity, light weight, and natural corrosion resistance are an unbeatable combination that makes aluminum the ideal choice for high-voltage power lines and other industrial applications. Aluminum is extremely easy to work with in production and manufacturing. Cutting, sawing, carving, drilling, and machining are a lot easier on aluminum than other metals, such as stainless steel and steel. This again reduces the cost of working with aluminum, providing a cost-effective solution for many different industrial applications. You will frequently hear about how malleable aluminum is, especially when it comes to custom aluminum extrusions. This is why it is so easy to extrude aluminum alloys and create custom aluminum products. Aluminum is ideal for use in the production of many parts and can be used for numerous applications across just about every industry. We have been saying this all along just about every step of the way. All of the characteristics of aluminum make it extremely cost-effective for businesses to use to their advantage. Malleability, machinability, recyclable, plentiful, sustainable, temperate, light in weight yet extremely strong and durable – there are so many reasons why aluminum is the top choice for industry. Surprisingly, the price of aluminum is typically lower than most other metals, and because it is lighter in weight than steel or stainless steel, it is cheaper to ship. If you would like to learn even more reasons why aluminum is the perfect choice for your business, give us a call at 508-824-8631. Our team can answer any questions that you might have about extrusion, fabrication, custom design and post extrusion operations, such as custom finishing. Call today to speak with a representative or to place an order for custom aluminum products with Silver City Aluminum.